A super busy week, an improvised diner for 8, less than 3 hours on D day to prepare everything, but no stress, I have everything under control! It has been a long weekend, frankly, I am a little bit tired, and have no energy to go into details as I usually try to do when I have people over for diner. This salad was a life saviour: quick, easy and tasty! That was perfect for my diner. 1- Wash all the vegetables. Chop each tomato into 12 pieces. Cut the cucumber in 4 parts length wise, remove the seeds, and chop it. 2- Chop the peppers into small dices, slices the radishes, and chop the onion finely. 3- Mix all the ingredients into a large bowl. 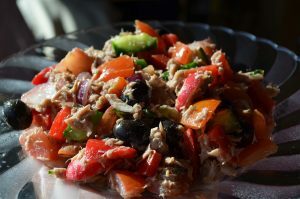 Drain the water from the tuna can and add the tuna in the bowl with the olives, mix well. 4- In a smaller bowl, mix the oil with the vinegar, salt and pepper and mix well. 5- Keep the salad in the fridge until time to serve. When you are ready to eat, pour the dressing in it and mix well.